In geometry, the rhombic triacontahedron, sometimes simply called the triacontahedron as it is the most common thirty-faced polyhedron, is a convex polyhedron with 30 rhombic faces. It has 60 edges and 32 vertices of two types. It is a Catalan solid, and the dual polyhedron of the icosidodecahedron. It is a zonohedron. of the diagonals are in the golden ratio. This animation shows a transformation from a cube to a rhombic triacontahedron by dividing the square faces into 4 squares and splitting middle edges into new rhombic faces. The ratio of the long diagonal to the short diagonal of each face is exactly equal to the golden ratio, φ, so that the acute angles on each face measure 2 tan−1(1/φ) = tan−1(2), or approximately 63.43°. A rhombus so obtained is called a golden rhombus. Being the dual of an Archimedean solid, the rhombic triacontahedron is face-transitive, meaning the symmetry group of the solid acts transitively on the set of faces. This means that for any two faces, A and B, there is a rotation or reflection of the solid that leaves it occupying the same region of space while moving face A to face B. The rhombic triacontahedron is somewhat special in being one of the nine edge-transitive convex polyhedra, the others being the five Platonic solids, the cuboctahedron, the icosidodecahedron, and the rhombic dodecahedron. The rhombic triacontahedron is also interesting in that its vertices include the arrangement of four Platonic solids. It contains ten tetrahedra, five cubes, an icosahedron and a dodecahedron. The centers of the faces contain five octahedra. The insphere is tangent to the faces at their face centroids. Short diagonals belong only to the edges of the inscribed regular dodecahedron, while long diagonals are included only in edges of the inscribed icosahedron. The rhombic triacontahedron can be dissected into 20 golden rhombohedra: 10 acute ones and 10 obtuse ones. The rhombic triacontahedron has four symmetry positions, two centered on vertices, one mid-face, and one mid-edge. Embedded in projection "10" are the "fat" rhombus and "skinny" rhombus which tile together to produce the non-periodic tessellation often referred to as Penrose tiling. The rhombic triacontahedron has 227 fully supported stellations. The total number of stellations of the rhombic triacontahedron is 358,833,097. This polyhedron is a part of a sequence of rhombic polyhedra and tilings with [n,3] Coxeter group symmetry. The cube can be seen as a rhombic hexahedron where the rhombi are also rectangles. A rhombic triacontahedron with an inscribed tetrahedron (red) and cube (yellow). A rhombic triacontahedron with an inscribed dodecahedron (blue) and icosahedron (purple). The rhombic triacontahedron forms a 32 vertex convex hull of one projection of a 6-cube to three dimensions. 20 of 32 interior vertices form a dodecahedron, and the remaining 12 form a icosahedron. An example of the use of a rhombic triacontahedron in the design of a lamp. IQ stands for “Interlocking Quadrilaterals”. Danish designer Holger Strøm used the rhombic triacontahedron as a basis for the design of his buildable lamp IQ-light (IQ for "Interlocking Quadrilaterals"). Woodworker Jane Kostick builds boxes in the shape of a rhombic triacontahedron. The simple construction is based on the less than obvious relationship between the rhombic triacontahedron and the cube. 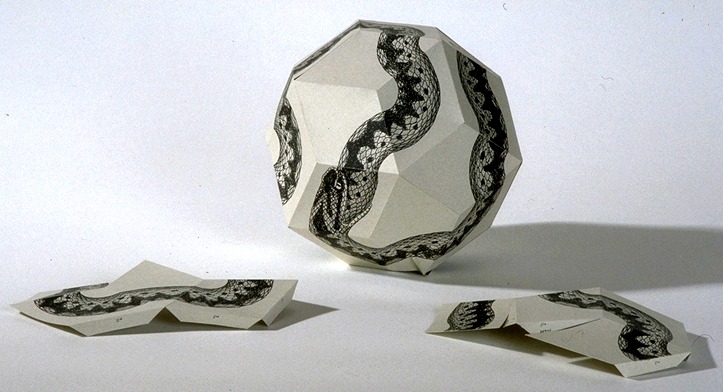 Roger von Oech's "Ball of Whacks" comes in the shape of a rhombic triacontahedron. The rhombic triacontahedron is used as the "d30" thirty-sided die, sometimes useful in some roleplaying games or other places. ^ Stephen Wolfram, "" from Wolfram Alpha. Retrieved January 7, 2013. ^ Pawley, G. S. (1975). "The 227 triacontahedra". Geometriae Dedicata. Kluwer Academic Publishers. 4 (2–4): 221–232. doi:10.1007/BF00148756. ISSN 1572-9168. ^ Messer, P. W. (1995). "Stellations of the Rhombic Triacontahedron and Beyond". Structural Topology. 21: 25–46. Eric W. Weisstein, Rhombic triacontahedron (Catalan solid) at MathWorld. A viper drawn on a rhombic triacontahedron.